OUR GOAL: Develop safe, sustainable means of profitable vegetable production for smallholder farmers to increase the supply of nutritious vegetables to consumers. Farm profitability begins with good quality seed and good agricultural practices throughout the crop production cycle. A value chain, market-aware approach is emphasized, ensuring farmers grow what will sell, rather than trying to sell what has been grown. Farmers must protect crops from pests and diseases, and misuse of pesticides is a serious problem in developing countries. WorldVeg develops biological, mechanical, and cultural methods for integrated pest management (IPM) of important insect pests and bacterial, fungal, and viral diseases in vegetables to reduce or eliminate pesticide use. Key successes include IPM systems for controlling eggplant fruit and shoot borer in South Asia, simple protected cultivation systems to exclude pests, and grafting technologies for tomato and pepper production in the hot-wet season. The Center also works on low cost drip-irrigation, fertilization, and crop rotation systems suited to smallholders, and has ongoing programs to integrate, disseminate, and extend these improved technologies. Smallholder farming families with limited space can generate more income from growing vegetables than staples such as rice or maize. Labor-intensive vegetable production also provides employment opportunities. However, because most vegetables are highly perishable, up to half of the yield can be lost before consumption. The Center works to improve vegetable supply chains in developing countries, particularly for traditional vegetables, which can be a major source of nutrition and income for the poorest. The World Vegetable Center develops effective and simple diagnostic tools for characterizing and monitoring major insect pests and bacterial, fungal, and viral diseases. We also evaluate resistant lines, biological control methods, and cultural practices to develop integrated management technologies for major pests, and we are a partner in developing the CGIAR Systemwide Program on Integrated Pest Management. The water requirements of selected vegetables are being characterized under different agroecosystems. Integrated crop and soil fertility management packages are being developed for selected vegetables to improve the efficiency of water and nutrient use. 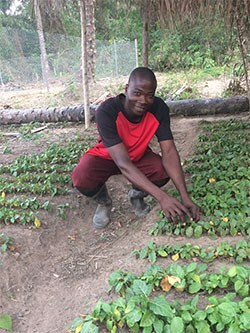 The Center works with national agricultural research and extension systems, NGOs, and small-scale farmers to expand the adoption of vegetable production technologies that improve farm productivity, increase incomes, and help sustain farm livelihoods. We identify major constraints and determine site-specific dissemination strategies in targeted regions, work with advanced research institutions to develop new technologies, and strengthen the capacity of local partners and farmers to promote technology adoption. Our research seeks to understand the impact of improved technologies on production systems and livelihoods. WorldVeg provides training in improved postharvest management methods, from appropriate harvesting methods and packhouse operations to safe food handling and marketing, and develops appropriate technologies such as solar dryers and zero-energy cooling chambers to reduce postharvest losses. Provide capacity building in improved postharvest management, food safety, and enhanced marketing skills. WorldVeg focuses on developing the capacities of smallholder farmers and processors of tomatoes, chilies, leafy vegetables, and indigenous vegetables to participate actively in local, regional, and national value chains.